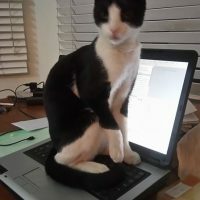 Missing my black and white cat - Name is Mista - he is friendly and might be in your house or building. He has black all over his eyes down to his nose. Black coat on his back and white under his belly. Please look we will pay a good reward for his return to us. This Ad has been viewed 258 times and got 1 reply.